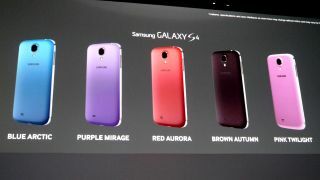 The Samsung Galaxy S4 has added five new colours to its arsenal as the Korean firm looks to suit everyone's taste. You now get to pick from Blue Arctic, Purple Mirage, Red Aurora, Brown Autumn and Pink Twilight on top of the original black and white which arrived at launch. Samsung didn't reveal when these new colours would be available, or detail if they would be arriving in all countries - but we'll update this article once we find out.More blips! Fancy some more bite sized news? Check out more of our blips.